Directed by Olivier Dahan, this big show traces the irresistible rise of Mozart, an extraordinary composer, eternal adolescent, deep and sensitive artist, in search of absolute music and looking for his father recognition. More than 400 costumes, a stunning period set. and over fifty artists on stage including lyrical pop singers, actors, dancers, and musicians. 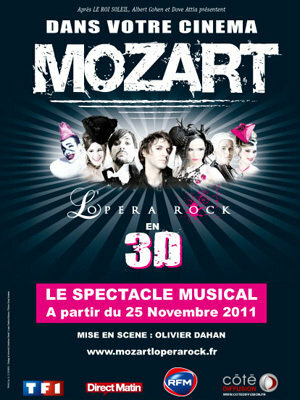 "Mozart, l'Opéra-Rock" takes us into a whirlwind of emotions to the beat of a musical blend Pop and Classic. The show was scheduled in France end of November, but -thanks to an unforecasted success- two more dates are now offered in December 2011. Synopsis: The show starts when Colloredo is named successor to the Prince-Archbishop of Salzburg. The new king is an austere authoritarian man which is insensitive to the music of Mozart and allergic to the enthusiasm and the impertinence of the character. For Mozart, Salzburg's life quickly becomes untenable. He was 20 when he decided to leave his hometown with his mother in search of a better future in a European capital. The journey of the composer will be made of failures and cruel disappointments.But at the end, Mozart will experience glory, love, rivalry before its ultimate fall and misery. He left his best work, the Requiem, unfinished. Remaining dates : 04 December and 18 December in many Franch cinemas. Ticket price: 19€ (plus 3D glasses if you dont' have them already). Booking provided by FNAC Spectacles for most cinemas. 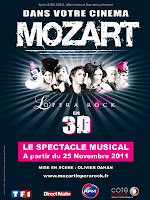 Mozart L'Opéra Rock au cinéma en 3D ! from Mozart L'Opéra Rock on Vimeo.